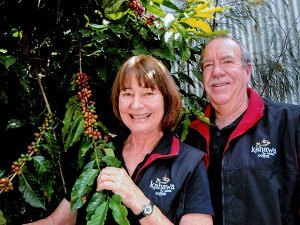 A decision to pack up their old lives in Canberra and try their luck at coffee farming on the Alstonville Plateau seems to be paying off for Jos and Wendy Webber. 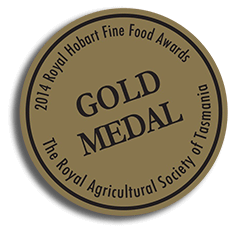 Kahawa Estate Magma was awarded a gold medal in the Espresso Class at the 2014 Royal Hobart Fine Food Awards. The Tintenbar couple has just taken out a gold medal for their Magma roast at the 2014 Royal Hobart Fine Food Awards. They also picked up two bronze medals – for their Magma roast in the Cappuccino class and for their Lava roast in the Plunger class. Their property, Kahawa Estate, was a macadamia and avocado farm when they bought it in 2004 and they have since converted the whole 13 acres to coffee. “It seemed like a good idea at the time,” Jos said. Wendy said the fact it could be grown without the use of pesticides and herbicides was also a factor in their decision. “We were both keen gardeners and interested in horticulture and wanted to live in the (Northern Rivers) area, and coffee seemed like an easy crop to grow,” Jos said. Experience has modified his view somewhat, but they seem to be doing okay for an ex-vet and a physiotherapist. They have previously won a silver at the Sydney Royal Easter Show and a bronze at Hobart. Jos said the soil, climate and rainfall made the region good for coffee growing, adding that growers and roasters from the local association – the Australian Sub Tropical Coffee Association – took out 10 medals in Hobart. “This is an international event, so we have beaten coffee from Ethiopia and Brazil,” Jos said. In order to make the business profitable Kahawa Estate roasts, packages and markets their own products and Jos said winning medals gives them assurance they are on the right track. The couple has retail outlets in Ballina, Tintenbar, Nimbin, Brisbane and Perth as well as online.